The fast changes of direction, pivots, side-steps and jumps of tennis mean that ankle injuries are very common. Most ankle injuries in tennis are sprains—an injury to the ligaments that hold the complicated bones of the ankle together. This injury is often called a rolled ankle (ankle inversion sprain), because it usually happens when the foot is flexed downward and rolls in. The impact usually damages the ligaments on the outside part of the ankle. A rolled ankle can keep you off the court for weeks. Even worse, it can become a chronic problem. The biggest risk for an ankle sprain is having a previous ankle sprain. 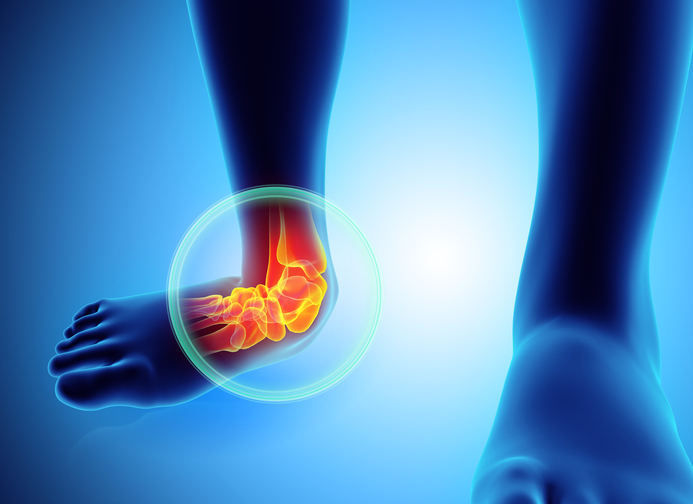 The re-injury rate for ankle sprains is high, approximately 80 percent. Fortunately, prompt treatment can do a lot to reduce the discomfort from the ankle sprain. And by getting good rehab treatment, you have a good chance of avoiding a recurrence. A sprained ankle very quickly shows all the classic signs of inflammation: Swelling, pain, redness and warmth. The traditional advice for treatment is to apply ice immediately. That will help, but if at all possible, low-level laser therapy (LLLT) should be applied instead. Some practitioners now carry portable lasers and can apply them courtside. If no laser is available, I strongly recommend seeking out a chiropractor who has one as soon as possible after the injury, preferably within a few hours. LLLT works by using very safe, focused laser light to stimulate the damaged tissue and trigger a cascade of natural chemicals, such as anti-inflammatory enzymes, that are part of the natural healing process. The stimulation helps reduce inflammation, relieve the pain, and improve joint mobility. Low-level laser therapy is painless—there’s no feeling of heat. The treatment is also very quick, taking only about five minutes per session. ►Proteolytic enzymes, including trypsin, chymotrypsin and bromelain. ►Natural anti-inflammatories, including Boswellia, turmeric, ginger and vitamin C.
Bringing down the inflammation is important, because too much inflammation in the area for too long can cause permanent damage and lead to chronic pain and recurrent ankle sprains. An ankle sprain affects the whole leg, all the way up into the hip and buttocks. All the foot and leg muscles tense and shorten to protect the area. Rather than taking muscle-relaxing drugs, I recommend nutrients such as calcium, magnesium, lemon balm and valerian. These supplements relax your muscles without causing grogginess. For severe ankle sprains, I also recommend supplements containing tetrahydro iso-alpha acids (THIAA), berberine and amino acids. These supplements provide the building blocks your body needs to aid in producing the natural enzymes needed to heal and remodel damaged ligaments. Begin taking these supplements on the fourth day after the injury to bring down the swelling even more. Lack of conditioning is one of the most common causes of ankle sprains. If your muscles, tendons and ligaments around the ankle joint are weak, this can make a sprain from a bad landing more likely. We also know that weak gluteus medius muscles are very closely correlated to rolled ankles. These muscles, located on the outside part of your hip, control hip abduction—the movement of your leg away from the midline of your body. If they’re weak, your hip drops and your knee turns in with every step. Your heel strike when your foot hits the ground is turned in as well. If you go too far and the ankle rolls inward, spraining the outer ligaments as it does. How can you tell if your gluteus medius muscles need to be strengthened? If you sprain your ankle, it’s almost a certainty that they do. Beyond that, work with a chiropractor to perform a functional movement assessment. In my experience, that usually shows precisely how weak the muscles are and guides me as I create a personalized exercise program to help you strengthen them. One of the best indicators of ankle sprain risk is the single-leg balance test. If you’ve already had a sprain and cannot stand on one leg with your eyes closed for at least 30 seconds, you’re at risk for another. An exercise program to prevent future ankle sprains will almost always involve side leg lifts, hip extensions, and working with a wobble board to improve proprioception (your sense of where your body is in space) and balance. We’ll also work on specific exercises to strengthen the lower leg and ankle joint. I recommend beginning your ankle rehab exercises immediately after the injury. In my many years of practice dealing with elite and local tennis players, I’ve found these protocols to be the best means for rapid recovery and increased performance after an ankle sprain.